Blog Is your brand story working? How Healthy is Your Brand Story? Brand stories help organizations grow more quickly and with greater sustainability. Complete the checkup to find out how yours might be working. 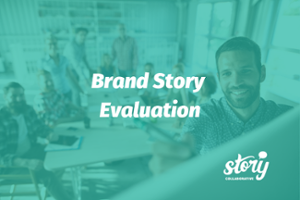 A brand story is something that is unique to your business or nonprofit, and when it’s strong, it makes a huge difference in the way that your organization grows. With a strong brand story, marketing, sales and even customers will help you grow because the real value of the organization will sync up with the way the human mind is wired – for story. Brand Story. Get it right and you will grow. Whether you are a growing company, just getting started or on a tight deadline to create new growth, getting the story right, has to be job number one. A strong brand story makes your ad costs lower, increases retention, and builds a group of champions more quickly. It is a lot more than simply logo, style or font choices. A strong brand story moves your organization from someone trying to get noticed, to the inside of the customer lifestyle. >Answer 9 Questions to Unlock Your Brand. If your story score is less than 70, you are missing big opportunities for growth. If you are above 70, you’re doing lots of things well, and could add more power to your communications by improving all the key elements of your brand story. For scores lower than 50, some critical brand story development is needed. Investments in brand story payoff in ways that you’ll see quickly, as well as in shifts in employee and customer attitude and enthusiasm.